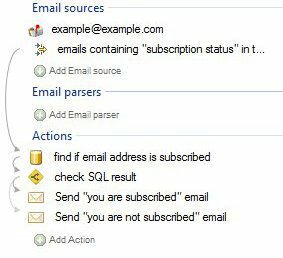 Email Parser is often used with databases. This example shows how to use a database action along with a conditional run. The workflow is the following: It takes only the incoming emails containing in the email body “subscription status” using an email filter and replies if the sender is subscribed or not. The subscription status is kept in a database table. Subject: Am I subscribed to the newsletter? Please, let me know my subscription status.Thanks.